Can you guess what our carved out pumpkins are supposed to be? 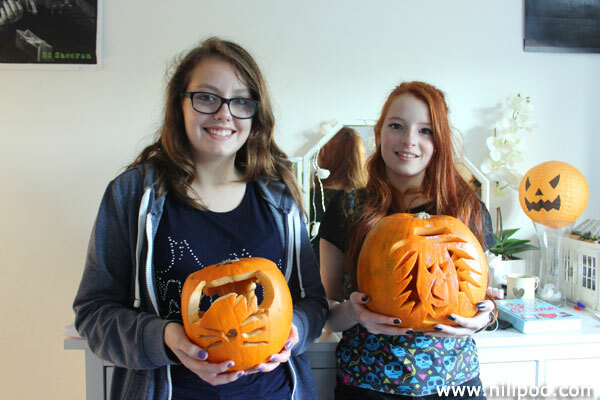 Liv is holding a Dan and Phil inspired cat whiskers pumpkin, although we got a little bit carried away with the carving and a large piece of the front ended up falling off. Oh well, never mind. Nia is holding a larger pumpkin with a kind of cartoon(ish) witch's face, complete with some zigzag hair at the side of her face. These looked much better at night, when they were lit up with flickering nightlight candles, although they soon went mouldy and mushy after a few days, and therefore had to be thrown out. No matter, it'll soon be October once more and then we can carve some more, all over again, most probably something to do with Dan and Phil. Maybe we'll save up for one of their cute lion hats or llama hats to wear as we create our masterpieces!